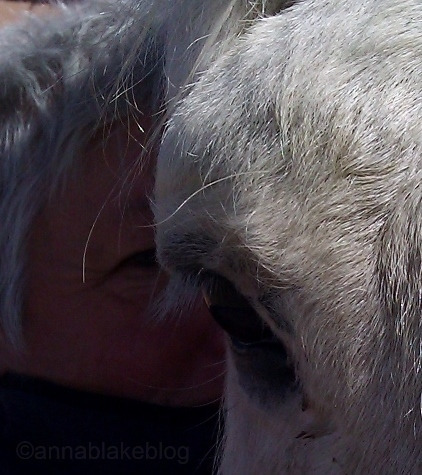 Relics: Senior horses are the very best. The Grandfather Horse and I have been together for so long that the line between us blurred to gray and we can’t remember which century we met. We’re rickety relics of a story the two of us made up before we were born. ← Listen First, Train Later. Wonderful portrait, Anna. And neither of you appear to be too rickety. Thanks for first smile this Monday morning, warm fuzzy mood brightener. So sweet Anna. Your affection comes thru in the portrait loud and clear! 28, retired for the last 11 years thru injury. Lame as a brick. He still takes my breath away. It’s all him. Thanks! This is very sweet and touching, 🙂 I hope to have a bond like you and Spirit! Such a wonderful word picture. I have a grandmother horse – 29 and still pretty tough. I’m not sure why I love her as she remains rather aloof and often annoying in behavior but my heart melts into her. Thanks for your loving words. We’re lucky, aren’t we? Thanks for commenting.